Posted March 31st, 2019 by Deborah Kimmett & filed under Events. This email contains info for the April Writing Workshop, new shows and Hazel. Do you wonder how long your career will last? She is 93 years old, and has worked 67 years as a waitress, at the same restaurant. The Goof is the spot to go to in the beaches. It’s actually called the The Garden Gate: Good Food was written vertically on the sign. But forty some years ago, the ‘f’ fell off the word food, and people shortened its name to Goof. And, Hazel has been there from the get go. She still works 14 hours a week and says she loves it as long as she is driven to and from work. 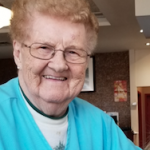 When we asked her name, she said, Hazel, but added people often call her Hurricane Hazel because she used to move so fast. Well, she still is quick and even claims to have never spilled a bowl of soup. We ordered rice so didn’t need to test that claim. As well as being a pro she loved that we wanted to know about her life, and told us all the ins and outs of a long career. “Can’t lives on won’t street,” Hazel said. When I asked her how things have changed since she started, she said the restaurant is bigger than it used to be so there are more steps to take to the kitchen. After a delicious spicy beef eggplant ( for under 10 bucks I might add) Hazel brought us our bill, she said she had told her boss she might retire soon, and he thought that was a bad idea. “What would you do, all day, Hazel? April 4th,, 2019 Downward Facing Broad, Toronto, Alumnae Theatre. CBC Radio Taping. ONE TICKET LEFT. April 28th, 2019, Toronto: The Commons, One Day Memoir Writing Workshop. SPECIAL SALE: $88 dollars! ( SIGN UP before April 5th, 2019. PM me for details. July 19th, 2019 Downward Facing Broad Amherst Island. St. Paul’s Church. Tickets on sale next week. Oct 26th, 2019 Empire Theatre, Belleville, Ontario. Tickets on sale next week.